Skirt steaks are a cut of beef from the diaphragm section of the cow. Typical features of this cut include a strong beef flavor and a grainy texture. 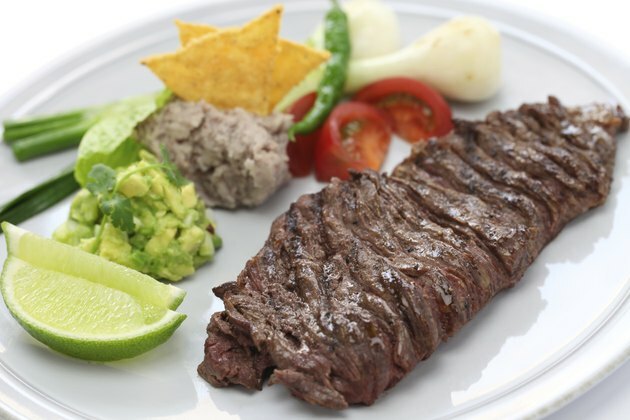 Cuts of skirt steaks are typically long and thin. When panfrying skirt steaks, choose a cut of beef that is approximately 3/4-inch thick. Cook the skirt steak on the pan only until it reaches medium since well-done skirt steaks have a tough and chewy texture. Cut the skirt steak in half so it fits well in your skillet and trim off any excess fat with a sharp knife. Mix the spicy mustard and lemon juice in a small bowl. Place the steaks in a shallow container and pour the mustard-lemon marinade over the meat. Cover the container with plastic wrap and place it in your refrigerator. Take the steaks out of the marinade after 1 to 2 hours. Discard any excess marinade. Heat a cast-iron skillet to medium on your stove, and lightly cover the surface of the pan with canola oil. Set the skirt steaks into the preheated frying pan. Use a spoon to baste the steaks with the pan juices several times during cooking to help the meat retain its moisture. Fry the steaks on each side for approximately 3 minutes for medium-rare doneness. Cook for 4 minutes on each side if you want it to reach medium doneness. For medium-rare, the internal temperature taken with a meat thermometer will be between 130 and 135 degrees Fahrenheit. Medium steaks have an internal temperature of 140 to 145.